« An Ideal Husband: Is perfection best? Robert Frost (1874-1963) was an American poet, and published one of his most famous poems, The Road Not Taken, in 1916. This poem is short and relatively simple, yet I find it profound. The first stanza opens with the image of a fork in the road, and the speaker – wishing he could travel both – wonders which one to choose. The speaker picks one of the roads in the second stanza, saying that it looks less worn, but once he walks along it, discovers they are worn about the same really. In the third stanza, the speaker reveals his desire to go back one day to take the other road, but realises that it doesn’t often happen that way. “Way leads on to way” signifies how, in life, often one decision then leads to a new place with new choices to make. The speaker then thinks what might happen in his future. The fourth stanza reveals that in the future “ages and ages hence”, the speaker may look back “with a sigh” and say how he took one road and that choice “has made all the difference”. The speaker does not reveal whether the sigh is one of satisfaction or one of regret, and likewise, whether the difference that the choice has made is a good difference or a bad difference. “The road” in this poem can be thought of as a metaphor for a decision or choice. 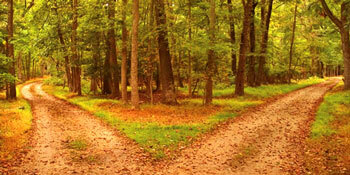 A fork in the road therefore represents two choices that need to be made, where choosing one prevents the choice of the other one. Many of life’s choices are like this… who to marry being an obvious one! What I love about this poem is that is represents how choices lead us on a journey through our life, in the same way as a road leads us on a journey through the countryside. Where will your choices lead you?